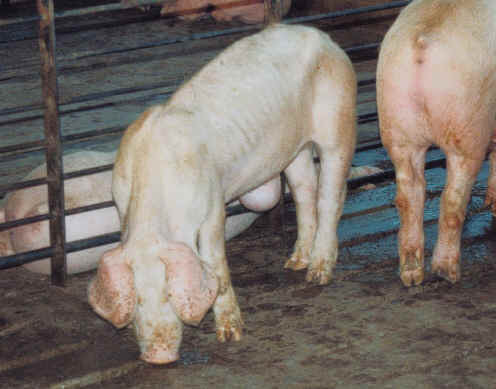 (Pig Exploitation - Factory Farming - 13) The pig in the foreground is suffering from an untreated rupture. Since money is of primary concern to pig farmers and individual medical care costs more than the pig is worth, they let conditions like this go untreated. The skinniness of the pig is an indication of his or her suffering. We need to put a stop to this inhumanity. We need to stop eating animals!